The OMT filter is a low-pass waveguide filter based on E-plane corrugated impedance structure utilizing 14 irises and 13 cavities. Each of irises contributes a reflection zero to the reflection frequency response of filter and each cavity contributes a transmission zero to the transmission frequency response. 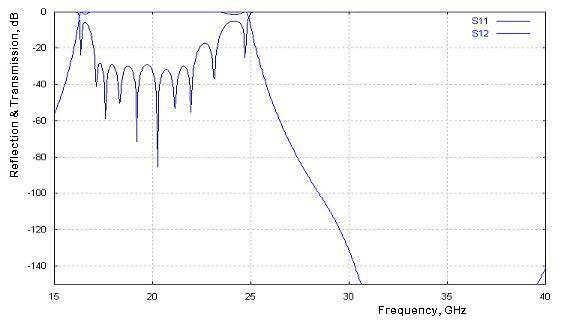 The reflection zeros form the physical (3dB) pass-band of the filter, which is extended from 16.25 GHz to 24.9 GHz. The transmission zeros form the physical stop-band, which is extended from 28.5 GHz to 42 GHz providing more than 100 dB rejection of the frequency spectrum carried by the dominant waveguide mode of TE10. There is intermediate (roll-off) zone of negative slope of transmission versus frequency response, which is extended from 24.9 GHz to 28.5 GHz. 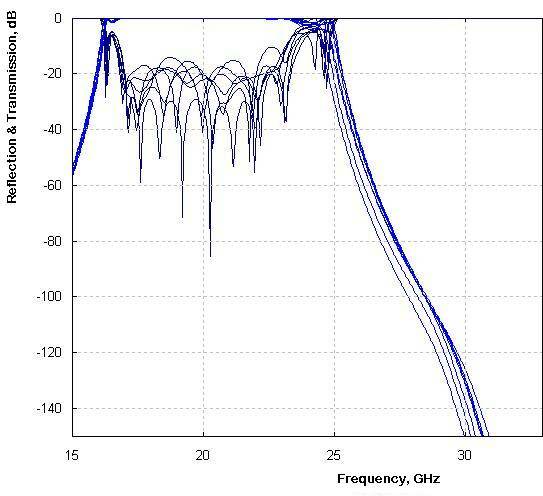 The filter structure shows lack of rejection of frequency spectrum from 31.5 GHz to 38.5 GHz, because of possible propagation of the spurious TE20-mode throughout the filter. 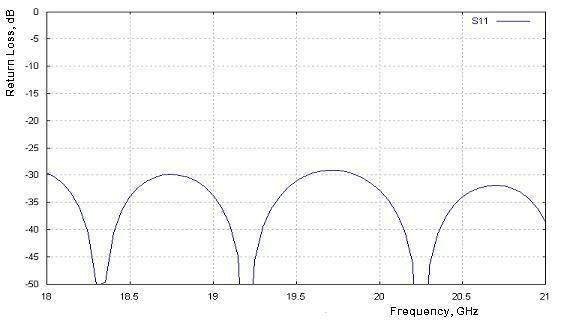 The actual rejection of the filter in this frequency band is generally unpredictable, as it depends on external existence of the mode. The filter structure is designed and optimized in respect to electrical parameters required by the specification (see Table 2.1 below) and evaluated over different combinations of tolerances (see Table 4.1). The filter can be assembled from two symmetrical half bodies, which are symmetrical in respect to the central H-plane (the plane of the wider waveguide wall). The two half bodies are to be connected by flanges and fastened by screws. The half bodies are to be made from zinc alloy. Each half body can be machined using milling or EDM technology (see paragraph 3). Silver internal finishing is recommended in order to reduce the dissipation loss. The simulation model represents a plurality of E-plane cavities connected to each other by short waveguide nodes (irises) and connected to external interface by EH-plane steps. Propagation of 36 waveguide modes is taken into account in cavities and the dominant mode is assumed to propagate in the nodes. The S-matrix is computed for each frequency point as cascade of sequence of cavities and steps. The computational method is tested on similar designs and deviation of the data simulated by the method from the results measured or simulated using other methods is found acceptable and predictable in most cases. The simulation method is applied to the filter model and the obtained results are represented as usual electrical parameters in the Table 2.0 bellow. It is assumed that the surface is smooth and not deviated from ideal rectangular. 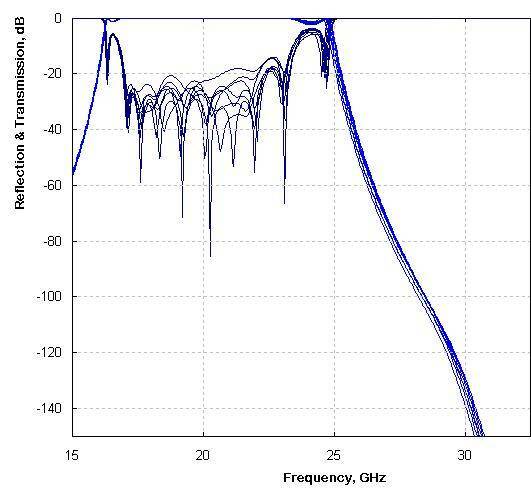 The scattering parameters are computed over frequency range from 15 GHz to 40 GHz with step of 30 MHz and the results are represented as reflection/transmission versus frequency charts (see Figures 2.1 – 2.4). 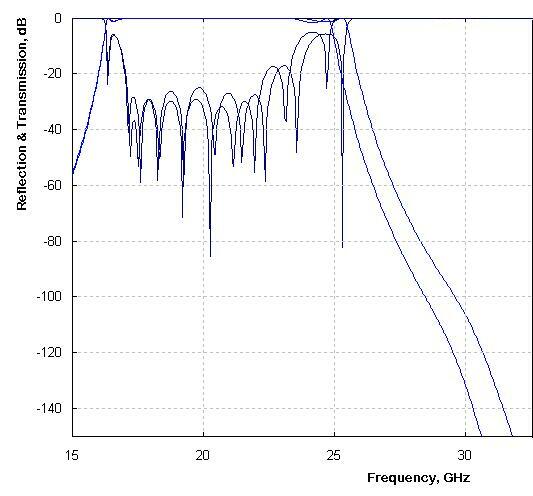 Figure 2.1: Original transmission and reflection versus frequency response. 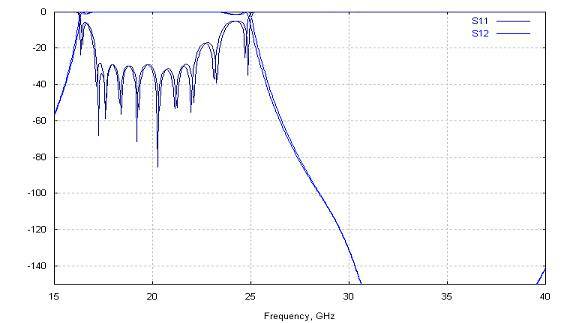 TE20-mode is found to reduce rejection in the frequency band from 31.5 GHz to 38.5 GHz, which is outside of the specified rejection bands. Transmission response plot corresponding to propagation of frequency spectrum carried by TE20-mode is presented in Figure 2.4 in case if the filter is used for other applications. 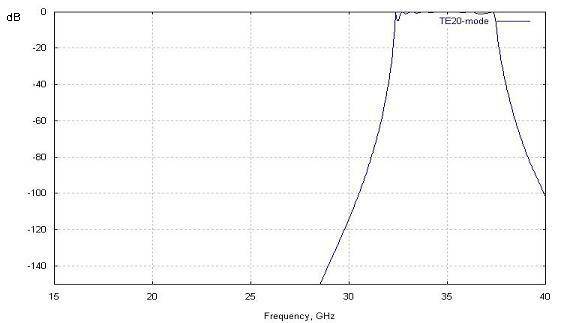 Figure 2.4: Worst case of transmission of spurious mode of TE20 versus frequency plot. Group delay response is computed and represented as X-Y plot below in Figure 2.6. As the solution of Maxwell equations does not exist in exact and closed terms for arbitrary boundary conditions, all methods used for prediction of electrical performance of practical wave guiding devices are numerical and approximate. The simulated model is already deviated from the physical model if even they are ideal. In accordance with correlation between simulation and test performed for similar filters, the numerical method used for simulation contributes a computational error making 0.5-0.7% shift of roll-off along the frequency axis with no considerable degradation of reflection response. This kind of tolerances is assumed to contribute a random shift of top, bottom and sides of each cavity in respect to their initial positions. It is found that the random tolerances mostly degrade the pass-band reflection response and do not generally affect roll-off unless the width and height of wave guiding channel are changed. The impact on the original frequency response (see Figure 2.1) caused by random tolerances is represented by charts shown on Figures 3.1 and 3.2 simulated for different deviations and combinations. Figure 3.2: Deviation of original response of filter caused by different random combinations of +/- 0.02 mm random tolerances. In addition to the random tolerances, rounding of convex cavity corners is expected, if the milling technology is used to fabricate the half bodies. Impact of radii is evaluated and represented as frequency response plot on Figure 3.3. 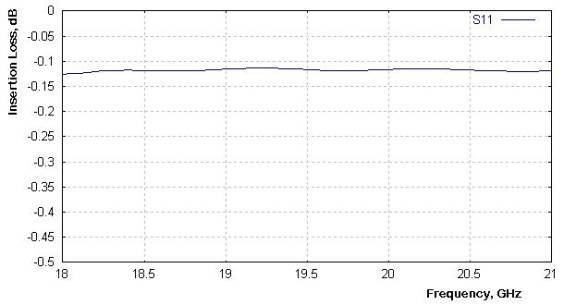 Figure 3.3: Evaluation of deviation of frequency response caused by 1 mm radii. Draft angle of tapering of cavity makes effect of reduction of equivalent cavity dimensions causing roll-off right shift (see Figure 3.4). 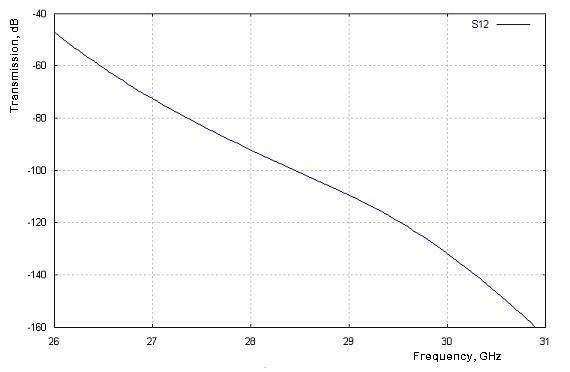 Figure 3.4: Simulated shift of frequency response caused by 3 dg draft angle. Deviation of frequency response caused by distortion of vertical currents flowing through contact areas is assumed to be negligible, if quality of contact between the half bodies is good. In accordance with the results of primary simulation and sensitivity for computational and production errors the expected performance of the presented filter is summarized in the Table 4.1 below. (*) There is no adequate margin, two tuning screws are required. EDM or milling with tolerances smaller than +/- 0.02 mm is recommended in order to achieve more than 24 dB return loss (less than 1.14 VSWR) with no tuning or adjustments. Smaller milling tool with radius less than 1 mm is recommended. Two tuning screws may be required in order to compensate degradation of performance if tolerances greater than +/- 0.03 are accepted. Internal silver coating is recommended in order to reduce dissipation loss in pass-band of filter to 0.07 dB. Contact grooves are recommended to improve contact between parts.